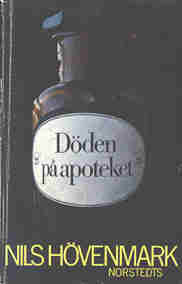 The cover of pharmacist Nils Hövenmark's detective novel "Death at the Pharmacy" (Döden på apoteket) is a good illustration for poison. The cover was designed by Leif Zetterling. Synthetic chemistry has given mankind many effective medicines and useful chemicals but also dangerous substances such as DDT, PCB, dioxins, nerve gases and organic mercury compounds. There has been a succession of poison scandals and today many persons are highly suspicious of synthetic products. This has also led to a situation with a large proportion of the population not wanting to use medicines prescribed by doctors since they feel they are damaging and have adverse side-effects. These people prefer to use various plant medicines and functional foods to treat complaints, since a common comprehension is that what is natural is considered non-dangerous. But this is no definite truth. Everything natural is not harmless and not all synthetic substances are hazardous. A reason why so many established pharmaceutical products have long lists of side-effects is that doctors are compelled to report suspected side-effects. In the case of herbal medicines there is no similar control or compulsion. Therefore it’s not always possible to find out about the side-effects of plant medicines. Even relatively harmless plant medicines can be damaging if they are used too often, in too high doses or on people who are allergic. Certain plants even contain substances that are poisonous but not lethal. There are plants which after long term use can give rise to cancer or adversely affect genetic disposition. Toxicology, i.e., research into poisons and their effects, is studied in many university departments, e.g., in the Section of toxicology at the Department of Pharmaceutical Biosciences, Uppsala University.